Based on the power of Microsoft Azure, Dynamics 365 for Customer Insights provides an SaaS service that brings together your enterprise data from multiple sources, and helps you generate 360 degree customer knowledge and insights which your staff can immediately understand and take action on. When connected to CRM systems, and especially Microsoft Dynamics 365, Customer Insights enables you to model interactions with customers based on transactions, events and activities, and define KPIs to monitor and measure business success. There’s no more having to keep spreadsheets or other systems up to date – Customer Insights manages the data ingestion, modelling, analytics and keeps the KPIs and insights up-to-date, recalculating them every 15 minutes so your firm is always well informed. Businesses can create rich and powerful visualisations, based on defined profiles, to deliver information and insights tailored for specific business roles or processes. These visualisations can then be embedded in your line of business applications such as Dynamics 365, so that your staff (and if you want to, your customers) can have access to the insight they need, when they need it. This can be truly transformational. 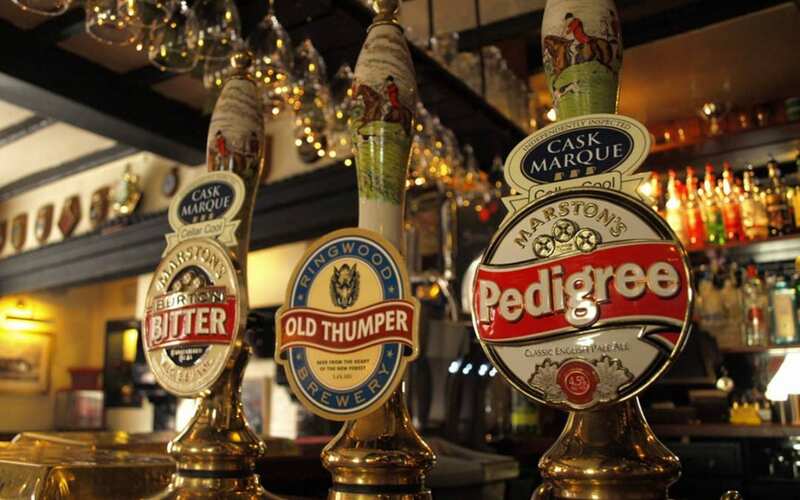 A great example is Marston’s, the brewers, pub, restaurant and inn brand. Faced with a national trend of pub closures and falling pub visits, they wanted to get back to a close and thoughtful relationship with their customers. 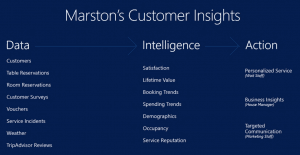 They combined Dynamics 365 and Cortana Intelligence to analyse a huge amount of their customer and social, weather, transport, and pub data, and have overlaid this to improve their customer engagement via Customer Insights. Via easy to use dashboards available at their point of sales systems, bar, restaurant and inn staff can see key customer’s preferences for food, drinks and rooms, any outstanding satisfaction issues, revenue flow and predictive value, even photos so the customer can be greeted in restaurants they’ve booked but aren’t well known in; it even suggests special offers which staff can make – and so provides a full retail view with personalised treatment. There’s a nice review here from one of our previous education sessions. It goes further; for each pub, there are dashboards where Marston’s can view and compare room occupancy, table bookings, revenue, customer satisfaction, even blend in predictions based on the effect of weather or transport issues, then rapidly change marketing based on this insight (see their video here) at short notice to maximise customer enjoyment, and business performance, throughout the seasons. Join Bruce Nicholson, Partner Technology Strategist at Microsoft for the latest news and roadmaps. The live webinar is Tuesday, the 21st of February at 13:00-14:00 UTC (UK GMT), 18:30 IST, 21:00 SGT, 12:00 AEDT, 08:00 EST. D You’ll need to register prior to attendance so please use this button to send us your contact details. We look forward to seeing you there!